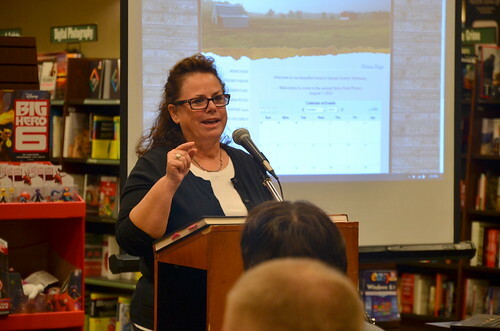 Cynthia Elder, local historian, photographer and editor of “the Catholic settlement” A History of St. Jerome Catholic Church 1836-2011, introduced the Church and the largest Picnic in the world (1984 Guinness Book of World Records) in her hometown Fancy Farm, KY to a Bowling Green and Warren County audience in Barnes & Noble on the evening of October 9, 2014. Her talk was part of the WKU Libraries’ “Kentucky Live!” speaker series. The next speaker for our Kentucky Live! Speaker series is Cynthia Elder, local historian, photographer and editor of “the Catholic settlement” A History of St. Jerome Catholic Church 1836-2011. In 1829, the Catholics settled for the first time in Fancy Farm, and built a log church in 1836. Later in 1854, they built the second church out of brick. The current church is actually the third church built in 1893.The history of the Fancy Farm Picnic is inextricably linked to the history of the St. Jerome Catholic Church. The Fancy Farm Picnic, or the St. Jerome Picnic, as it was known for a long time started out about 1880 with a few families from church having a Sunday get-together. Since its founding, the Fancy Farm Picnic has grown into a great political event held the first Saturday in August. This year it drew large crowds because of the hotly contested senatorial race. Elder’s book gives detailed accounting of the history of the Church, the town and the Picnic. In 1984, the picnic made the Guinness Book of World Records as the “largest picnic in the world.” The 175th anniversary of the Parish was celebrated in 2011.